Copyright © 2005 International Society for Computational Biology. Dr. Ewan Birney Named as the 2005 Overton Prize Winner! The International Society for Computational Biology (ISCB) has announced that Dr. Ewan Birney of the EMBL European Bioinformatics Institute (EBI), will receive the 2005 Overton Prize, which honors outstanding accomplishment of a scientist in the early- to mid-stage of his or her career who has already made a significant contribution to the field of computational biology through research, education, service, or a combination of the three. "Dr. Birney is best known for his advocacy of open source bioinformatics, and his generous contributions to the BioPerl community. Perhaps even more important to biology is his leadership of the Ensembl genome annotation project, providing rapid and accurate computational annotations for eukaryotic genomes. Dr. Birney follows his own advice, and credits the success of the Ensembl project to the open source development model," said Dr. Lawrence Hunter of the University of Colorado Health Sciences Center, the ISCB's founder and current chair of the ISCB Awards Committee. 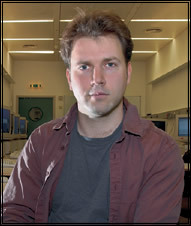 He added, "Dr. Birney is not only a hugely productive scientist, but he started young: his first bioinformatics tools, Pairwise and Searchwise, were published when he was an undergraduate at Oxford, and their successor, GeneWise, is still in broad use more than a decade after its introduction." The prize will be awarded at the ISCB's annual meeting, Intelligent Systems for Molecular Biology (ISMB), in Detroit, Michigan, from June 25 through 29. Dr. Birney will deliver the annual Overton keynote lecture on the final day of the conference at 8:30a.m. Dr. Birney trained as a biochemist at Oxford University and completed his doctoral studies in gene prediction with Dr. Richard Durbin at the Wellcome Trust Sanger Institute. He moved to the EBI in 2000 to coordinate the EBI's contribution to Ensembl, a joint project with the Sanger Institute to provide a comprehensive, automatically generated annotation for the genomes of higher animals. Currently Ensembl serves a million pages a week and has been used to generate gene sets for several genomes, including human, mouse, rat and chicken. Dr. Birney is a co-leader of the open-source bioinformatics toolkit Bioperl and President of the Open Bioinformatics Foundation, which supports the development of several bioinformatics toolkits. He said, "Making software source code and scientific data freely available is the best way to ensure scientific progress." Earlier this year Dr. Birney was awarded the 2005 Benjamin Franklin Award, which recognizes scientists who advocate open access to software and other materials in the bioinformatics. The Overton Prize was established by the ISCB in memory of G. Christian Overton, a major contributor to the field of bioinformatics and member of the ISCB Board of Directors who died unexpectedly in 2000. Previous recipients are Dr. Uri Alon of the Weizmann Institute of Science C2004), Dr. W. James Kent of the University of California, Santa Cruz (2003), Dr. David Baker of the University of Washington (2002), and Dr. Christopher Burge of the Massachussets Institute of Technology C2001). For further information on each of these past winners please visit the ISCB website at http://www.iscb.org/overton.shtml.